Holiday Trash Collection Notice: Please note that trash and bulk collection will take place on Tuesday instead of Monday next week due to the holiday. The Village Office will be closed on Monday and will reopen on Tuesday. Have a safe and happy Labor Day weekend! Thank you to all who made it out to the Village Picnic on August 13! There were nearly 200 people in attendance to meet their neighbors and enjoy the beautiful weather, food, music and activities. Special thanks to everyone who helped make the picnic possible, including Cel and Sherry Heck and the Wind Point Community Club, Gary and Marie Smith of Wind Point Living Magazine, Marty Meissner, Justus Morgan, Helen Savas, Steel Doves Steel Drum Band, Public Craft Brewing Co., Racine Zoo, Root Pike WIN, Jonathan Nelson of Modern Woodmen, Caledonia Fire Department and Wind Point Police Department. We look forward to seeing you at next year's picnic, back at the Village Green! 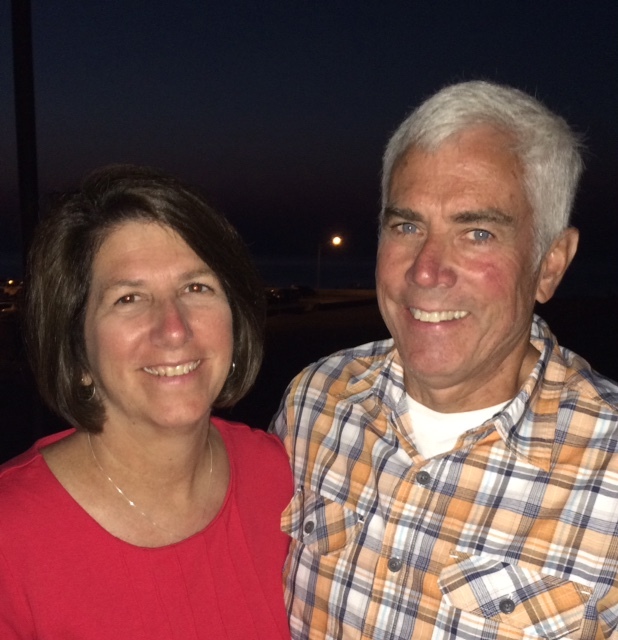 We are pleased to welcome Joseph and Mary Ann Huser to their new role as the on-site caretakers of the Wind Point Lighthouse! Both Joseph and Mary Ann bring a variety of talents that fit the needs and objectives of the lighthouse. Joseph currently serves as the director of facilities at The Pabst Theater Group in Milwaukee and has prior experience managing facilities for the YMCA. Mary Ann is employed as a secretary for St. Richard Catholic Church in Racine and has prior administrative experience at Butler University. Joseph and Mary Ann also operated a construction maintenance business together for 20 years. Joseph and Mary Ann will officially begin in their position on October 1. You can read more about the Husers in the recent Jounal Times article . 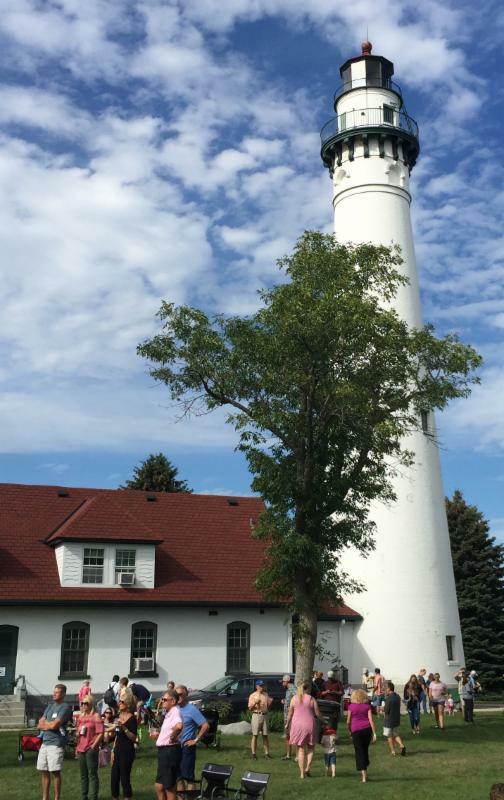 The Husers were officially introduced at a Lighthouse Committee meeting on August 15. About 20 lighthouse volunteers were also in attendance. At the meeting, Committee Chairman Charlie Manning discussed the Committee's interest in identifying values and visions for the lighthouse. Village residents who are interested in contributing ideas to this topic should contact lhvaluesvision@windpoint.org . In particular, the ideas should address "What is important to you about the lighthouse? What is your vision for this property?" Residents interested in submitting general ideas or suggestions can contact lhsuggestions@windpoint.org . Finally, if you have any interest in getting involved at the lighthouse as a volunteer, please complete the online form here . 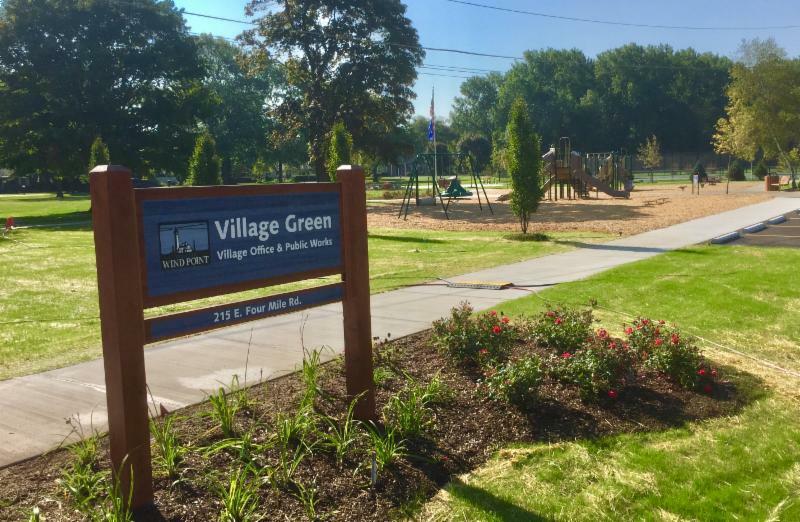 A great deal of progress was made at Village Green this past month with the installation of the new playground equipment, entrance sign and plantings. It has been great to see all of the kids trying out the new equipment! There are still some final pieces that we hope to see completed in the coming weeks, including the installation of the park pavilion, which is behind schedule due to shipment delays from the west coast. The new pickleball courts are scheduled to be completed this month; the two tennis courts will also be crack-filled and re-painted at that time. The eastern-most tennis court will be moved about five feet to create a safer distance from the fence and pickleball courts. The courts will be closed intermittently during the work. Thank you for your patience with the park project this summer! 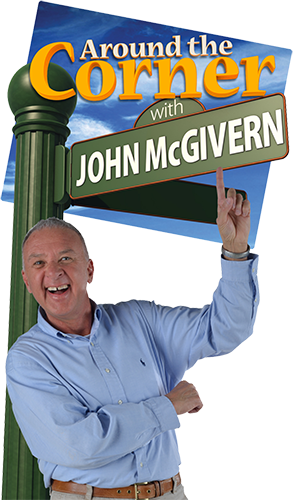 A crew from " Around the Corner with John McGivern" was in Wind Point and Caledonia over the past two weeks to shoot an episode featuring our two Villages. Around the Corner is a television show produced by MilwaukeePBS that features actor and TV personality John McGivern who visits unique communities in Wisconsin and explores how people "live, work and play." The show is currently in its fourth season, and will be in its fifth season when the Wind Point/Caledonia episode airs next spring. In Wind Point, the crew made visits to places like the SC Johnson Institute of Insect Science for Family Health and Wind Point Lighthouse, and met with interesting residents. The episode is scheduled to air Thursday, March 8, 2018 at 7 p.m. - in the meantime, other episodes of the show can be seen online by clicking here . 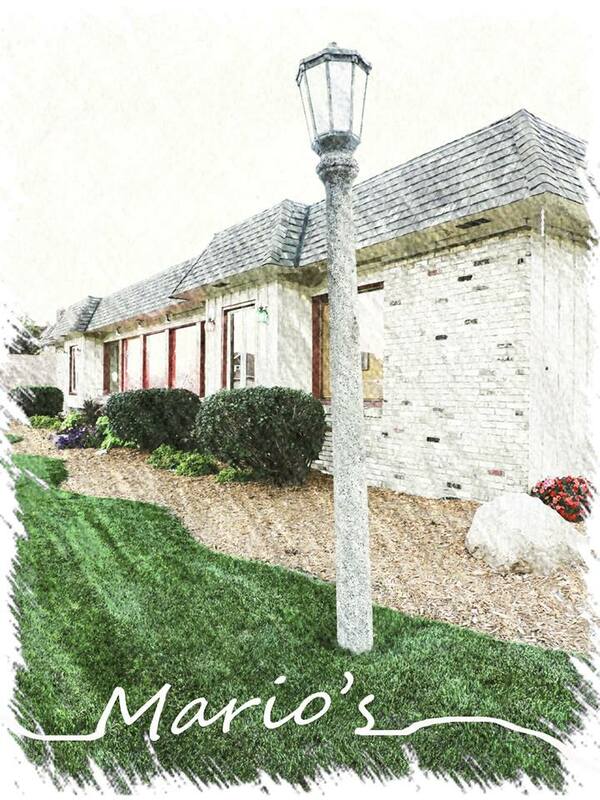 Wind Point Living Magazine and Mario's Restaurant (2322 Lathrop Ave.) are partnering together for a special fundraising event where 30% of all proceeds will benefit Wind Point Lighthouse Preservation efforts! This includes all food and beverages purchased between 4-9 p.m. on Tuesday, October 10. The Village has been very fortunate to have Brendan McGuire as a DPW Summer Laborer the past three summers. 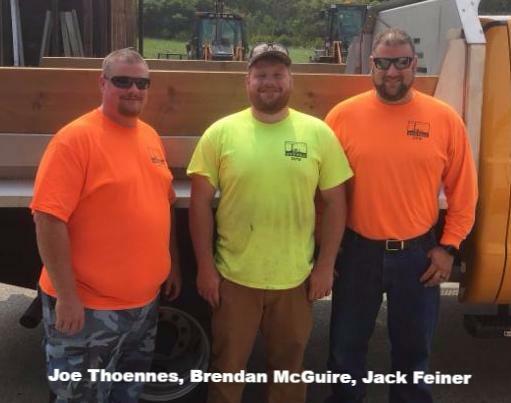 In addition to mowing the park and assisting with branch collections, Brendan has contributed to a wide variety of public works tasks and projects. He was a major help last summer during the transition of the public works supervisor and assistant positions. This summer, he helped create the wooded path section in the park, assembled new park furnishings and most recently has helped maintain the lighthouse grounds during the lighthouse keepers transition. Brendan's last day with the Village will be today, September 1, as he is set to start a full-time position with Premier Power Professionals. We wish Brendan the best in his new job, and thank him for all his hard work! Eifler Ct. and Lake Point Cir. Raven Turn, Raven Turn East and Redwing Ln. Hydrant flushing clears sediment from the water distribution line, helps maintain water quality, and verifies proper operation of the hydrants. In some cases, there may be slight discoloration for a few hours. This discoloration only affects the appearance of the water; it does not affect water quality. There is no health hazard associated with discolored water. Avoid washing laundry during scheduled flushing times. Wait until the water runs clear at the tap, then wash a load of dark clothes first. If pressure or volume seems low, check your faucet screens for trapped particles. If you have any questions, please contact the Wind Point Public Works Department at 262-639-3560. Wind Point is proud to have a professional part-time police department serving our community and the Village of North Bay. To help get to know our Wind Point officers, we are featuring a different officer each month. Our featured officer for September is Aaron Henry. How long have you been an officer with Wind Point? I started with the Village of Wind Point Police Department in the summer of 2016. So, I have been here for a little over a year. I was fortunate to have a prior relationship with current Wind Point Police Officer and current Mt Pleasant Police Department Sergeant, Paul Maccari. Sgt. Maccari had amazing things to say about the Village of Wind Point. I applied soon after. Do you have other police experience? 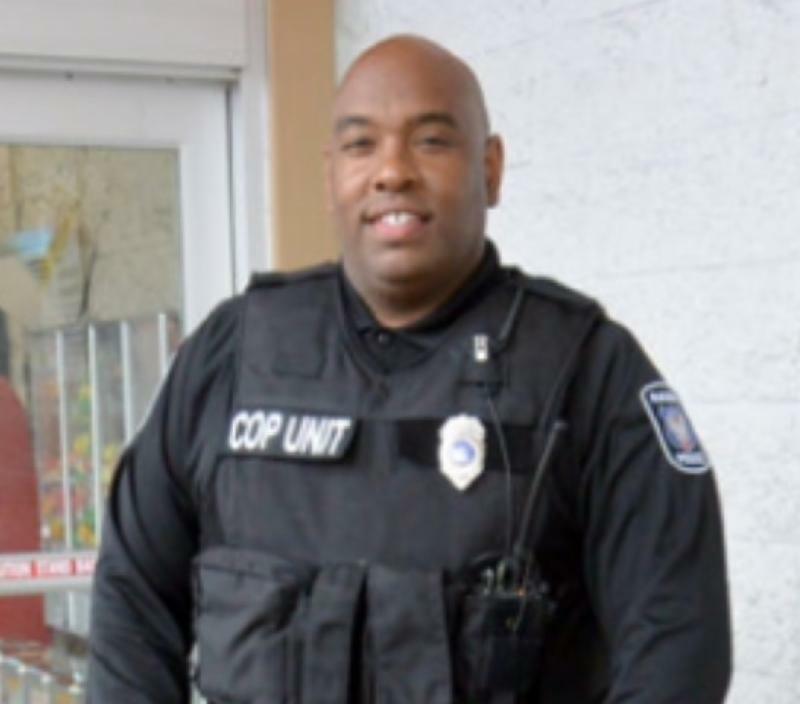 I worked almost nine years for the City of Racine Police Department. I have a rather unique story for how I became a police officer. My background is not in criminal justice as one might imagine. I have a degree in Finance and spent about 12 years in the financial industry. At the time, I was volunteering as a Reserve Police Officer for the Wauwatosa Police Department. After spending so much time building rapport and developing relationships in the community, I made a decision to leave finance and transition to the public service sector. I just felt the need to “help out” and really wanted to make a difference (on whatever scale – if possible) in the urban community. At the same time, my thought process was that I could always “come back” to finance but could not always “go in to” law enforcement. So, I took a huge leap of faith and transitioned over to law enforcement. I have three kids (ages 21, 16, and 11) so they keep me pretty busy. I also have an affinity for education. In my spare time, I am trying to complete a second master’s degree program. So, between the kids, work, and school, I am pretty busy. Why do you like working in Wind Point? I truly love working in Wind Point. The landscape of the community is extremely beautiful and simply gorgeous. Most importantly, the people here are amazing. It is so nice to actually have people wave and say hello. I love making my rounds. Wind Point is an outstanding community. Thank you and I appreciate the opportunity to serve. As a courtesy to your neighbors, please remember to move your garbage and recycling carts from the edge of the road after collections. 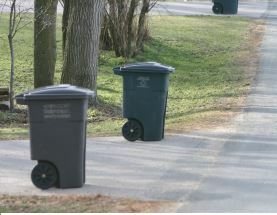 Carts should be moved within the same day after collection, or at least within 24 hours, to avoid unnecessary objects along the roadway and to help maintain the overall aesthetics of the neighborhood. Additionally, carts should be stored in an area of the property that is screened from public view, if possible. Thank you for your cooperation! 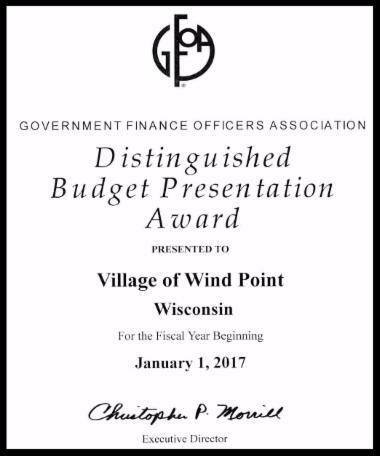 For a second consecutive year, the Village of Wind Point is a recipient of the Governmental Finance Officers Association (GFOA) Distinguished Budget Presentation Award for its 2017 Budget document . The award reflects the Village’s commitment to meeting the highest principles of governmental budgeting and organizational transparency. In order to receive the budget award, the Village had to satisfy nationally recognized guidelines for effective budget presentation. These guidelines are designed to assess how well an entity’s budget serves as: 1) a policy document, 2) a financial plan, 3) an operations guide and 4) a communications device. A total of 19 municipalities in Wisconsin received the award in 2016 and Wind Point was the lone recipient in Racine County. August 7 at 11:15 a.m. - PFIC reviews 2017 year-to-date and projected figures. Provide direction to staff on preparing the 2018 Budget. August 23 - October 15 - Standing Committees review 2018 Budget requests. August 28 at 11:15 a.m. - PFIC discuss personnel reviews and 2018 wage schedule. September 20 at 9 .a.m - PFIC reviews initial draft 2018 Budget. October 12 at 5:30 p.m. - Village Board reviews full draft budget at regular meeting. October 25 - Administrator/Clerk-Treasurer publishes budget summary and public hearing notice (State statutes require posting at least 15 days before hearing). November 9 - 2018 Budget Public Hearing and Village Board adoption. More information about meeting times and locations can be found on the Village meeting calendar webpage . All meetings are open to the public. 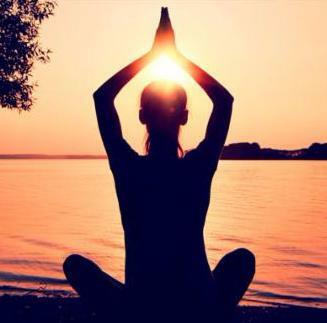 Enjoy the beauty of the lakefront with the therapeutic benefits of gentle flow yoga followed by a guided meditation. Every Friday morning at the Wind Point Lighthouse from 6:30-7:30 a.m. you can join a yoga class under the guidance of certified yoga instructor and Wind Point resident Maneeka Sandhu Decker. The class is open to men and women of all ages (teens accompanied by an adult). Class will be cancelled in the event of extreme cold, wind or rain. Where: next to the lighthouse on the north lawn in front of the flagpole. What to Bring: large beach towel, blanket or yoga mat. Positive spirit. Cost: $10.00 donation of which a percentage will fund lighthouse preservation. Contact: For questions or inclement weather contact Maneeka Decker via voice or text at 262-676-3332. We apologize that the wrong phone number was provided in last month's E-News for the Bridge Marathon. 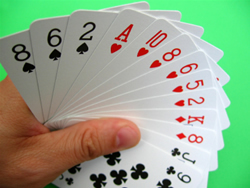 If you are interested in playing with the Daytime Bridge Marathon, please call Evelyn Gerum at 262-639-9351 . Play begins in August and goes through May. If you have a partner, great, but don't hesitate to call even if you don't have a partner -- we will help you find one. It is a great way to meet your neighbors! Presented a proclamation to Susan and Mike Arts in recognition of their 10 years of service as lighthouse keepers. Approved an amendment to the Planned Development Overlay District (Ordinance 17-04). Heard an update on the 2018 Budget process and timeline. Approved Change Order #1 submitted by Johnson and Sons Paving for Village Green construction in the amount of $21,434.34. Heard an update on the Lighthouse Keepers Hiring and discussed upcoming Lighthouse Committee meetings. Heard an update on the PBS Around the Corner shooting schedule. Approved a proposal from Hardy & Jensen to replace 5 windows and 2 doors at the lighthouse keepers’ quarters. Approved bids submitted by Vassh Excavating and Mileager’s for the Lighthouse Beach Green Infrastructure project. The next regular meeting is scheduled for Thursday, September 14 at 5:30 p.m. at the Village Hall (lighthouse).